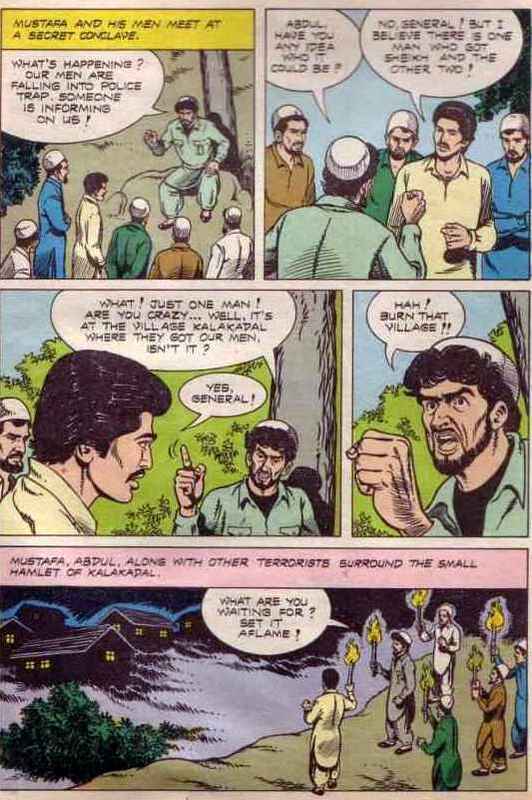 It was around 1989 in Kashmir that I first discovered the world of comics. I came across a treasure chest belonging to an elder cousin. I remember staying up all night, my first all nighter, to go through his entire collection comprising mostly of Phantom of Indrajal comics. I remember witnessing my first break of dawn from a window of my Massi's place in Chanpore. I was seven, I couldn't actually read those comics. Comprehending words was a challenge. Bubbles in the panels, a puzzle. But it was the colorful images in those panels that spoke to me. They spoke of some other magical worlds. A world were guns went 'RaTaRaTa', punches went 'WHAAM' and men went 'UUg'. 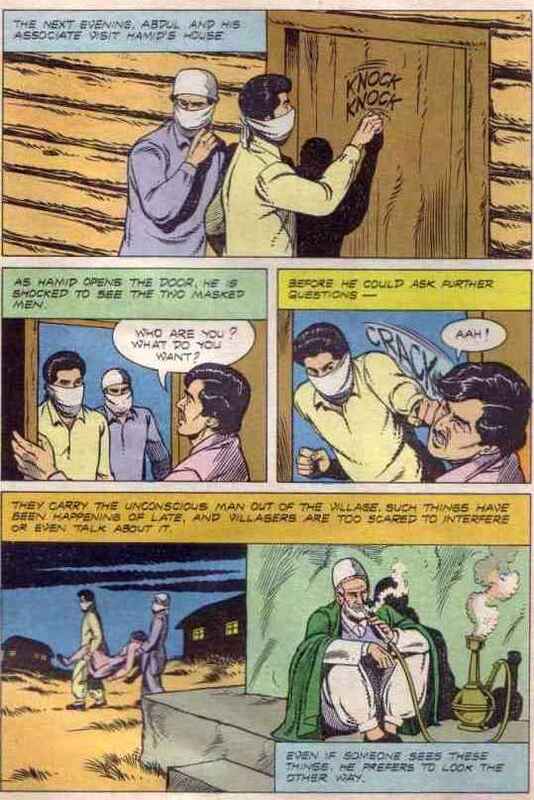 Recently, after having helped in a minor way in the creation of a new generation of comic in India on Kashmir and that too with a high dose of History, I couldn't help but wonder what Kashmir, the place, its people, looked like in earlier Indian comics. The most obvious place to start was Amar Chitra Katha. If it's Amar Chitra Katha, it has to be history. 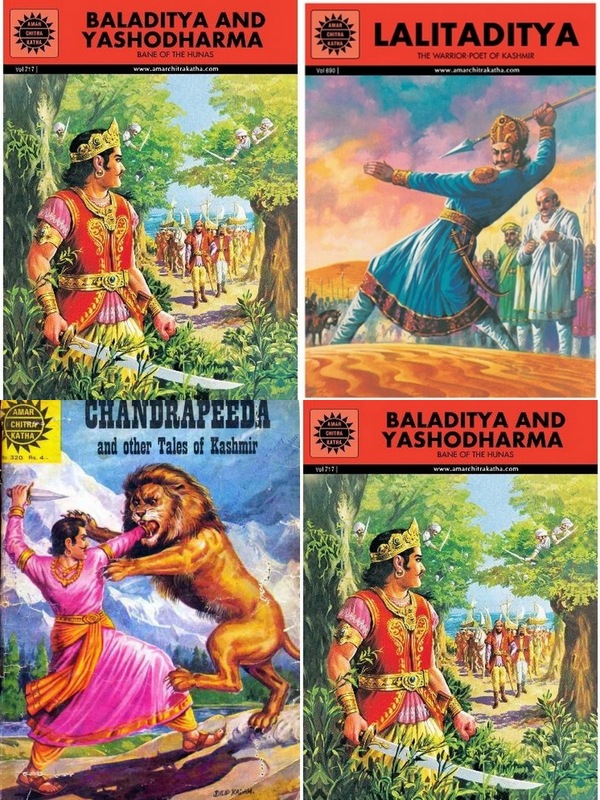 Amar Chitra Katha has a bunch of issues based on stories from Kalhana's Rajatarangini. Here the action is based in Kashmir (and please note Dharmendra or Amitabh was not the first hero to battle a wild cat, Jaydpeeda of Kashmir was). 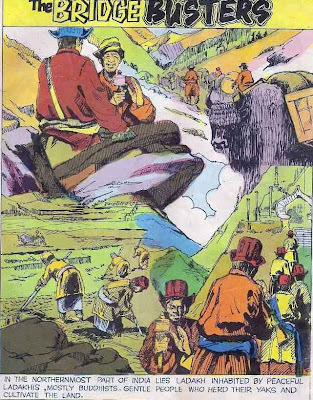 Some issues carry stories from Somadeva's Katha Sarit Sagara (in which we have more of Ujjain), and there are are some ancient 'travelogue' issues in which we see a panel of Kashmir (like in case of comic on Hiuen Tsang). That's about it. Next, we pick Indrajal. 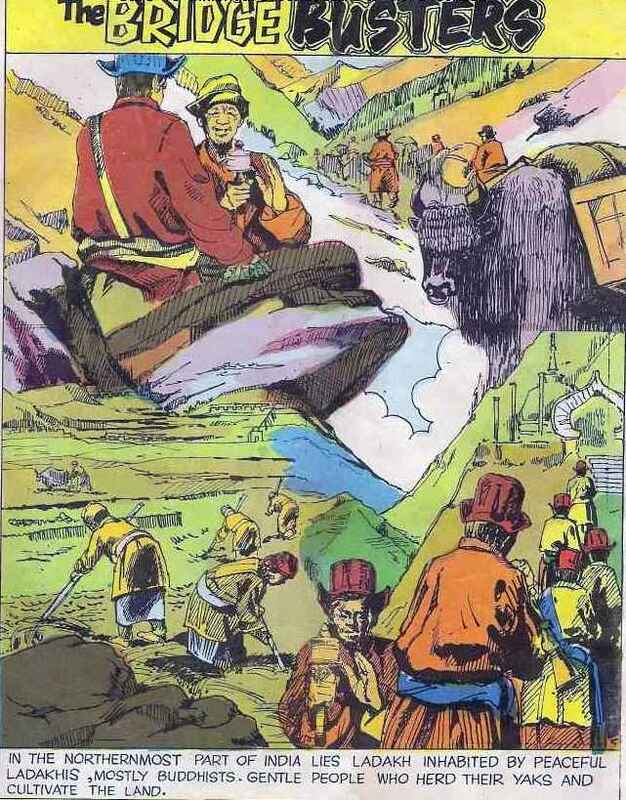 In its 'War-Series' comics, in one on China war of 1962, we see a glimpse of peaceful Ladakh. That's about it. But then in late 1980s, just as Kashmir began to simmer like never before, and just as Indrajal's readership was dwindling, Kashmir became a central prop for one of the 'newest' action hero's created indigenously at Indrajal. Dara, urf Rana Vikram Bir Singh, urf Raja Saheb, an flamboyant ex-prince of Kashmir who secretly works for Indian Intelligence Wing run by one Mr.Rao. In all there were about 8 issues published after which not only the series but Indrajal too shut shop. 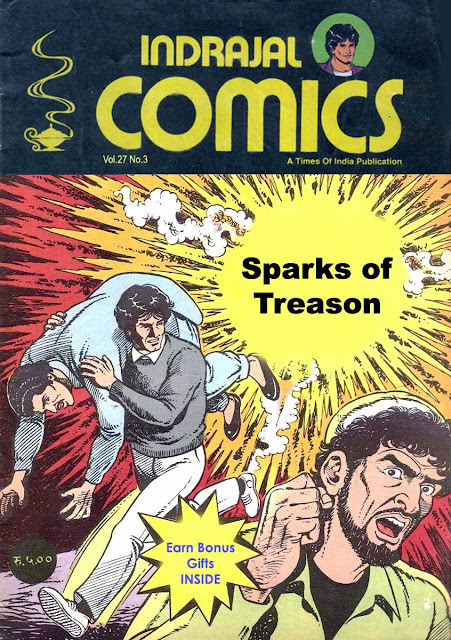 Of these 8 issues at least two stories are based in Kashmir - 'The Savage Mercenary' (with some of the action taking place on snow capped mountains) and 'Sparks of Treason'. Of these two, 'Sparks of Treason' is the most interesting specimen of 'Kashmir issue in Indian Comics'. The title and the cover sets the tone. Dara the super spy is called in by Mr.Rao to save Kashmir from a gang of Agent provocateurs who are tying to spark treason. The way that story unfold reminds one of the gratuitous Hindi films on Kashmir made in 1990s. And this comic came out in 1989. 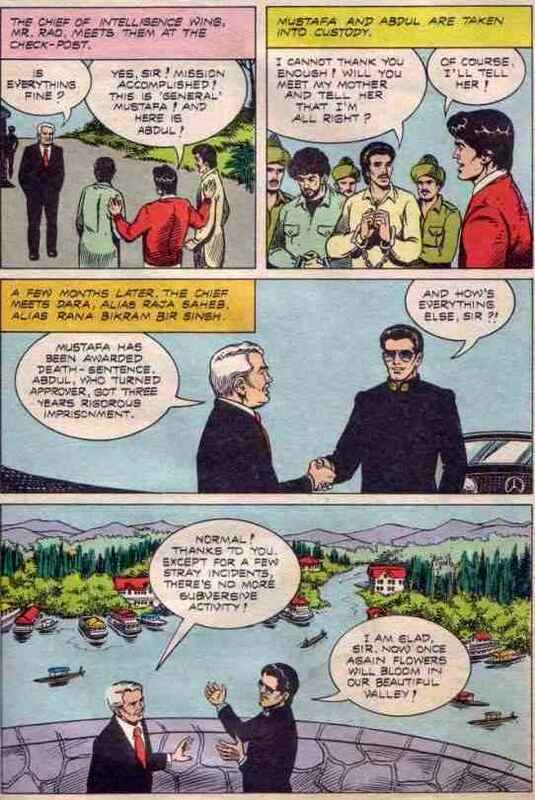 The way the situation is sorted out in the comic reminds one of a recent statement by Union minister Jairam Ramesh, "Spy agencies dictate Kashmir policy." 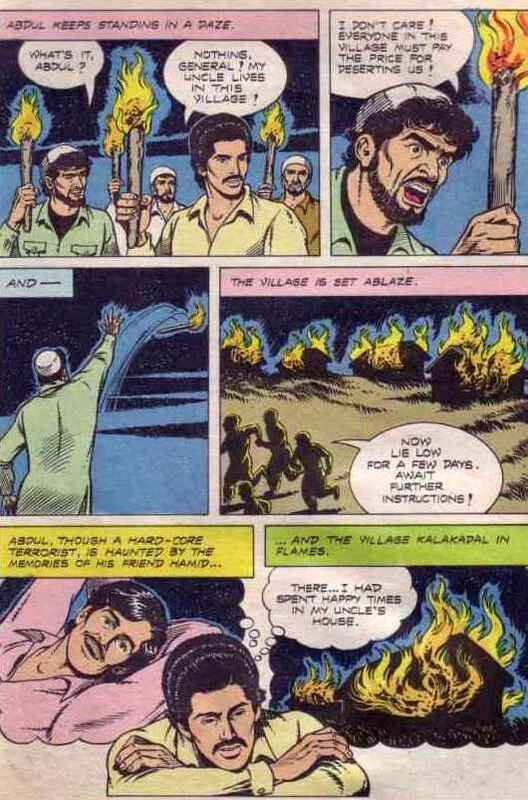 I was wondering did they have any Kashmiri Pandit characters in these comics ? No, even though they had a great opportunity in Dara comic where Mr. Rao could easily have been Mr. Kaw. 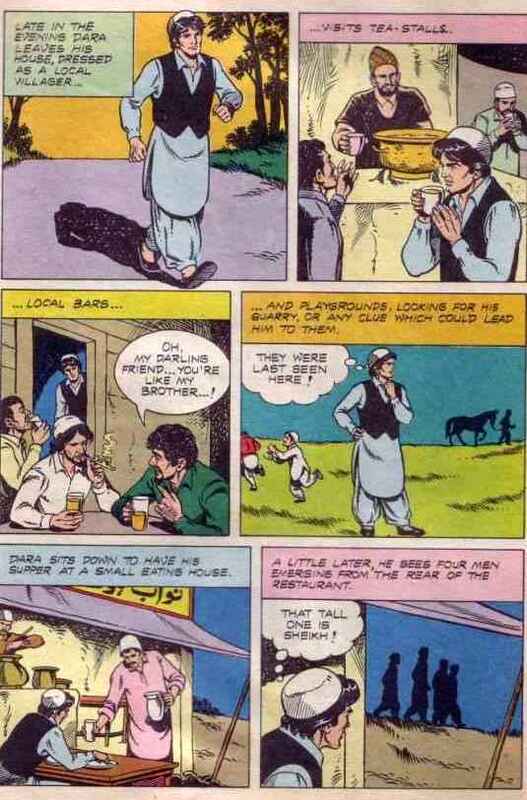 Which reminds me of a trashy Sunny Deol film around Kashmir called 'Jaal: The Trap' (2003) That film story could easily have been taken from a Dara Comic. Incidently in that film Sunny Deol plays a Pandit.